« Can You Take The Time To Listen? 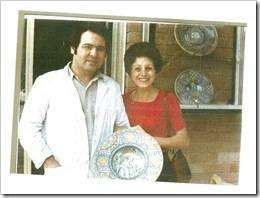 It was over 30 years ago…..in the late 1970-early 80s when my Aunt Dollie went to Italy and happened upon a ceramicist, Antonio Margaritelli. She was so taken with his beautiful pieces that he replicates based on Renaissance fragments found during local excavations, which provide him with information and inspiration that she had to have a piece to take home with her. According to the book, Deruta – A Tradition of Italian Ceramics by Elizabeth Helman Minchilli, Antonio was an apprentice for seventeen years before opening his own workshop in Deruta. His passionate approach to ceramics involves continuous research. 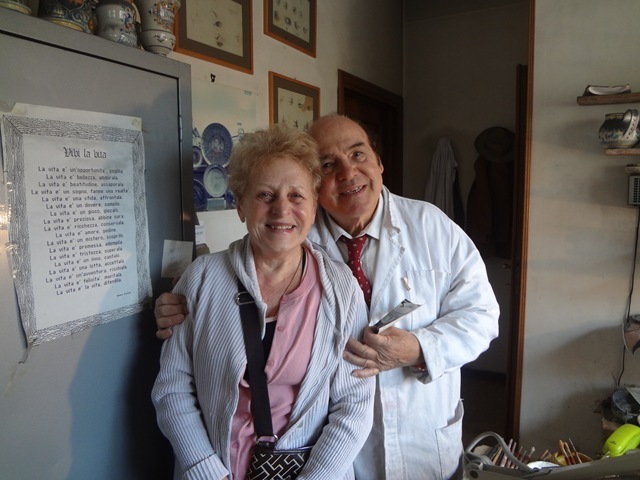 On our recent trip to Italy in April 2012, My Aunt wanted to go back to Deruta to see if she could find Antonio and take the picture above to him. So one beautiful afternoon we headed to Deruta, which is in the region of Umbria (poor mans Tuscany, my favorite area). 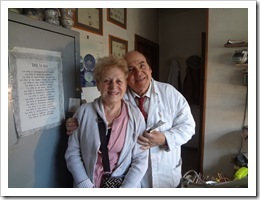 Although my Aunt was excited to meet her favorite ceramicist, there were a few doubting Thomas’ in our van. How could we find this man after 30 some years? We found several shops, showed the picture around and found his studio, but was closed that day. One artist told us that he had a workshop below in town and gave us some directions and off we went. To make a long story short we found his shop and went in. Antonio was sitting at a desk painting a bowl. My Aunt walked up to him and introduced herself (in Italian) and held out the picture of her and him together 30 some years before. He looked at the picture, the surprise, shock and delight on his face were indescribable! The first thing out of his mouth (in Italian) was “Avevo i Capelli!” (I had hair!). What an afternoon it was, listening to this wonderful artist, who was full of passion and stories for the gift he had and the delight and love he put into each hand created and painted piece of art he made for others to enjoy. He was one of seven children and the only to pick up the trade of ceramicist after his father. He showed us around his studio and explained that each piece was designed by him and there was no mass production. He loved what he did and whether it was 50 or 150 pieces that he created each year, it did not matter. All that mattered was that each piece was created from his love and stood alone. I cannot explain what it felt like to be with him and how his whole life revolved around his passion for creating works of art for others to enjoy. This was his life and he loved it and all of us there that day could feel it. 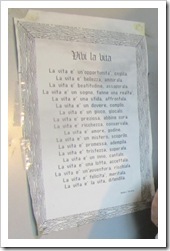 Interesting enough this poem by Mother Teresa titled “Live Life” hung in his studio. 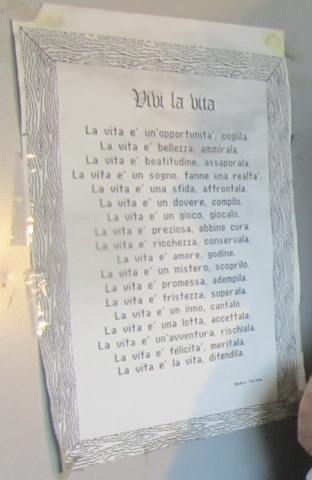 If you take the time to read it you will see that this is the life that Antonio chose for himself and interestingly enough my Aunt Dollie also lives this life, what a coincidence. This entry was posted on Wednesday, January 14th, 2015 at 8:00 am by Tina Del Buono, PMAC. Filed under Business Improvement, Happiness, Leadership, Motivational, Self-improvement. You can follow any responses to this entry through the RSS 2.0 feed. Both comments and pings are currently closed.